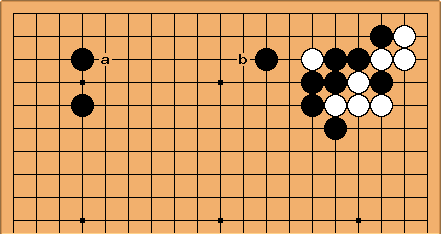 When is played to avoid a severe pincer in the enclosure opening, follows in the vast majority of pro games, permitting White to extend peacefully to . 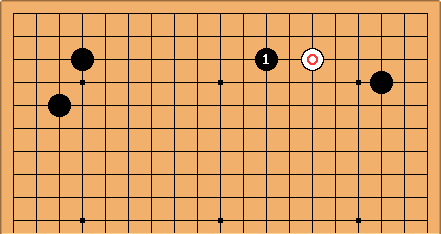 Is there a good reason why Black doesn't play here, to build up the top left area in front of the enclosure? This has been played in a handful of pro games, and by strong players. Judging by those games, the point is that White can aim at the later play at a, for a successful invasion. The stone is low and quite far away (seven-space gap). 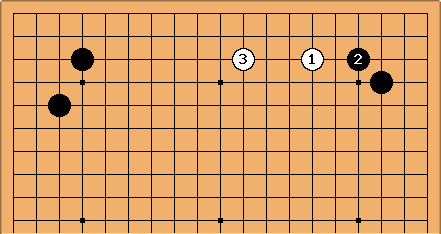 Therefore White can be quite happy to seek life in the right-hand corner with the joseki starting at b (see 3-4 point distant low approach, one-space low pincer). In case Black starts with the small high enclosure, White is even more likely to make the distant low approach, according to conventional wisdom. But again, Black's pincer is rare. In a couple of pro game examples with this position attained after the joseki in the right-hand corner, Sonoda Yuichi has played at a, and Michael Redmond at b. These ideas fit in with those on wedge - nine lines or fewer. As for the large low enclosure, just an online game by Muse on KGS; again the opponent used the front contact play. More recently it looks as if W prefers in this position making a mixed three space extension, and B takes either a or b (to invade) next. Or if B tenukis, W can take up position with c or d.
Most pros seem to favour a which makes an extension from the enclosure, whilst preventing c. To which 'e' seems the most popular reply. In two games on consecutive days of the 3rd Qisheng tournament in 2001 Tournament (semi Final games 2 & 3) both between Yu Bin, and Nie Weiping, this fuseki was adopted, and both players then went on to peep as follows. After this the games went different ways in game 2 of the semi final Nie played a, and in game 3 he played b. Game 2 (a) was won by Nie and game 3 (b) was won by Yu. Yu went on to win the Qisheng title in 2001.